Designed for use by participants during the course or as a resource after training, this product offers concise step-by-step instructions for responding to emergencies, as well as full-color photos. 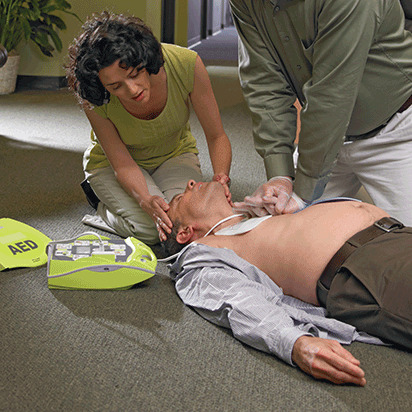 The primary purpose of the American Red Cross First Aid/CPR/AED program is to help participants recognize and respond appropriately to cardiac, breathing and first-aid emergencies. The courses allow participants learn how to provide immediate care to an injured or ill person until medical professionals arrive. Adult First Aid/CPR/AED Ready Reference is rated 4.1 out of 5 by 33. Rated 5 out of 5 by Rich56 from Nice Reference Guide Bought before taking the CPR/First Aid class. It was nice to review the procedures before actually going into the class too. Will also be nice to have for review afterwards. Rated 5 out of 5 by tina48 from A great quick reference! I ordered this and it was exactly what I excpected and it was delivered promptly. Rated 1 out of 5 by Boogiewicz43 from Adult First Aid/CPR/AED I expected much more with the shipping cost so high. I will not order anything from you again. Misleading ads. Rated 5 out of 5 by Deb OHN from great product, great service. I bought these training supplies for a First Aid CPR class at work. They were very helpful in teaching the class. There was a little mishap when recieving my order that was very graciously taken care of. I did not originally recieve my full order, but was sent the remainder of my order without any problems when brought to their attention. Every one makes mistakes, but not everyone makes up for their mistakes. Nice to know you are dealing with people who stand behind their products and customer service. I have ordered supplies with them several times in the past and will most definately order with them for future classes. Rated 1 out of 5 by sharky65 from Terrible communications I ordered the Adult and the Pediatric reference cards. Received the Adult cards within a reasonable period of time but it's been 3 weeks and still no pediatric ready reference cards. In addition I've received no information from the Red Cross concerning my order. Next time I'll look elsewhere for this type of info. Rated 5 out of 5 by Do not use a nickname from Good handout material The handout really helps the students and give them something to help them remember what they learned.